Glass cubicles are the perfect solution to temporarily divide interior offices without taking up too much vertical space. The drama and beauty of movable glass walls enhance any space. A lot of people think structural glass assemblies are required to accomplish this. However, Cube 7 Interiors partition systems are fully relocatable and can fit underneath suspended ceilings, bulkhead or concrete slab. 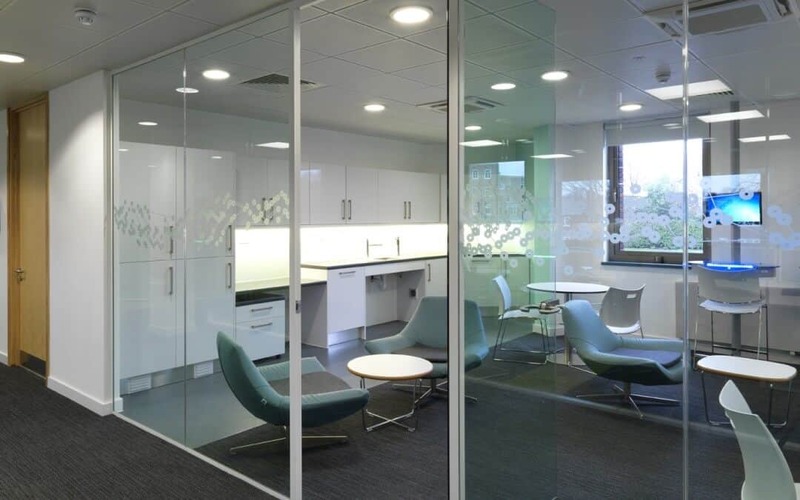 Designing your office with frameless glass doors and switchable privacy glass has never been more easy and affordable. Here is why. Most design or construction companies use Komfort Partitioning because they are the most popular in the market. But they are also the most expensive. However, Cube 7 Interiors spent a lot of time researching comparable products in order to transfer cost savings to our clients. We were successful and discovered SAS Partitions were more affordable when compared to Komfort Partitioning; but offers the same great look and flexibility. SAS partitions have been tested to the same degrees as Komfort Partitioning. Their relocatable partitioning systems provide up to 30 minutes’ fire performance and an acoustic performance of 48dB. SAS partitions can effectively divide and organize a variety of interior commercial spaces without breaking the bank. They offer solutions that help create the ideal balance between function and aesthetics, particularly with respect to office interiors. You get spatial efficiency, transparency, smooth transitions between spaces, comfort and flexibility. This allows our clients a great alternative to Komfort, Planet and Optima partitioning solutions. As such, we have made choosing the right interior glass wall partition and glass doors for your design specification within your reach. Contact us today to discover how to get amazing glass partitions for your office.